SpaceX launched its first Falcon Heavy launch vehicle this week. I was able to watch it live on my computer at my office and it was a truly spectacular event. As a test flight with a relatively low chance of success the rocket carried no "real" payload. Normally these sorts of tests carry ballast or some other sort of dead weight, but the founder of SpaceX, Elon Musk, thought that would be boring. And indeed it would have been. 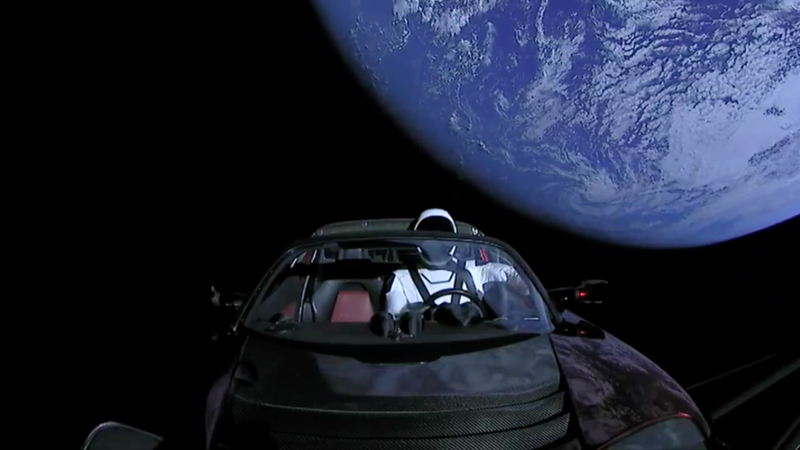 And so instead they sent aloft a cherry red Tesla Roadster. Tesla, of course, is also helmed by Musk and while all this could be dismissed as a publicity stunt, I appreciated the gesture. I am in no way comparing myself to Musk - obviously he and I function in very different planes of influence and importance - but I certainly recognize his desire to humanize (or at least humorize) the tasks he undertakes. It's the same reason Michael Jackson and David Hasselhoff inhabit the renderings I produce. It's the same reason this website is littered with hidden Easter egg links. It's good to take seriously the important thing you do in life. But it's also OK to wink at the people you encounter along the way.